Hoof Picks - Hammered Horse Products, L.L.C. These hoof picks are hand made one at a time. No two hoof picks are identical. They are durable and well-balanced. They make great gifts and come in a variety of wood types. Red Oak hoof pick. $15.00 plus shipping. Walnut hoof pick. $15.00 plus shipping. Aspen hoof pick. $15.00 plus shipping. 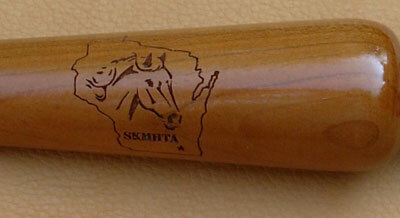 Mahogany hoof pick. $15.00 plus shipping. Cherry/Aspen hoof pick. $18.00 plus shipping. Walnut/Aspen hoof pick. $18.00 plus shipping. 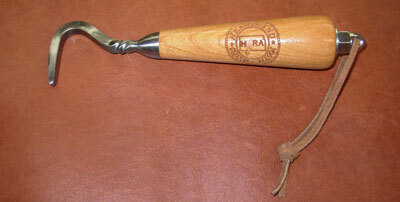 Australian Lacewood hoof pick. $20.00 plus shipping. Purple Heart hoof pick. $20.00 plus shipping. Cherry handle with walnut and maple inlays. $45.00 plus shipping. Cherry/Walnut/Rosewood inlay hoof pick. $45.00 plus shipping. Walnut/Aspen/Rosewood inlay hoof pick. $45.00 plus shipping. Aspen/Walnut/Rosewood inlay hoof pick. $45.00 plus shipping. Frontierman pick with deer antler handle and brass accents. $65.00 plus shipping. 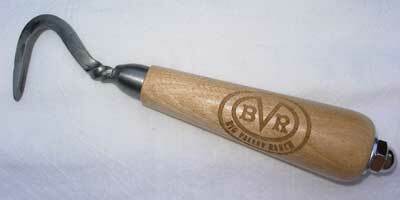 Laser engraving on hoofpick handles is available upon request. Custom logos or other wording can be engraved on handles. Great for special events, awards or advertising your horse facility. For a quote on logos or wording, please send an email to hammeredhorse@att.net. For logos, please attach a high definition pdf or jpg file of your logo to the email. There is an initial setup fee for engraving logos, so the more you order, the less the per item cost will be. For repeat orders using the same logo, there is no setup fee. Shown below are examples of engraved hoofpicks. Please contact us at hammeredhorse@att.net for prices. Prices will vary with the number of picks ordered. Engraved wood pick - Ride for the Cure. Close-up of engraved wood pick. Engraved wood pick with mahogany handle. Engraved wood pick with birch handle. Engraved wood pick with mahogany handle and optional strap. Engraved wood pick with walnut handle.